Pressed for time I asked a friend which of the two books Mark Douglas wrote, I should read first, The Disciplined Trader written in 1990 or his second book Trading in the Zone written 10 years later in 2000. He felt that everything in The Disciplined Trader was in Trading in the Zone so he recommended that one. After I read Trading in the Zone, I read The Disciplined Trader four months later. I think he made the right choice on which book to read first however, I do not think the books are very similar and am glad I read them both. This last point is quite interesting when you think about it. You have no idea when you enter a trade who is in the market at that time. You don't know what they are thinking or what they want. You also don't know what will happen. A major world event could happen, the leader of a country could make a really stupid decision, the CFO of the company you just bought could decide to retire or any of hundreds of unknown events could happen. And there isn't a thing you can do about any of them, except get out of your position. So your set up was good and the trade did not work, that happens. There is no system on the planet that works 100% of the time. 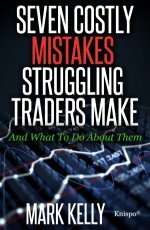 When you build a trading system, back test it, know how it is suppose to perform (at least in theory), know that it is profitable over a given number of trades and know what to expect then you are ready to begin an exercise that Mark Douglas outlines in the final chapter of Trading in the Zone. As you begin to do this exercise, all of your inner demons which do not like rigidity will start to show. You will start to think about changing your system, adding parameters, skipping trades because of something you heard or become fearful due to a development somewhere in the world. I started this exercise on March 1, 2013. This is the 2nd time I have started the exercise. The first time I didn't get very far. I have a higher resolve this time around. I have only entered two positions to date and will be entering orders on Monday March 18 for two more stocks. When you learn more by hearing, you can check out an interview of Mark Douglas on WTV. He does not go over the above exercise during this interview however, you will get a good idea on his thought process. You can learn more about Trading in the Zone and Mark Douglas by checking out his website. By June 2, 2013, I had entered a total of 16 trades. Most unfortunately, have been losers. I have determined that the system does not trade as frequently as I would like. This is important, as to frame a phrase from Robert Kiyosaki, "the velocity of money" the harder your money works for you the better off you will be. On reviewing historical trades, the system wins over time however it is heavily based on how I handle the big winners. Thus, if for some reason I do not take a specific trade and it turns out to be a 10 times risk winner then the system starts to break down. In the current test, I did not take BZH on April 19, 2013 at 14.68 because earnings were reported to be in less than 10 days and I my rule going into these trades was not to enter a position within 2 weeks of earnings. In this case, the stock advanced to 23.29 and I would have gotten out of the position at 20.69 on May 29. Another weakness of the system is, it is looking for trend reversals after a double bottom. These have high payouts when right and frequently the signals are false. I have recently purchased AmiBroker and will be using the backtesting feature of AmiBroker to more fully explore the concepts I am using to see exactly what type of an edge I have with this type of system.